The inside of the nose is covered with moist, delicate tissue (mucosa) that has a rich supply of blood vessels near the surface. When this tissue is injured, even from a minor nick or scratch, these blood vessels tend to bleed, sometimes heavily. Nosebleeds near the front of the nose, called anterior nosebleeds, are very common since this is the most accessible area to injury. In most cases, this type of nosebleed is not serious. It usually can be stopped with some local pressure and a little patience. Only rarely is a nosebleed life threatening or fatal. In these cases, the hemorrhage (severe bleeding) is usually from an artery in a posterior location, higher and deeper in the nose. Posterior bleeds usually drain down the back of the throat, but can also bleed out of both nostrils. Nosebleeds also commonly are caused by trauma, such as nose picking, forceful blowing of the nose or severe facial trauma from an automobile accident or contact sports. A hot, dry indoor climate – The hot, dry indoor air causes the delicate nasal skin to crack and bleed. 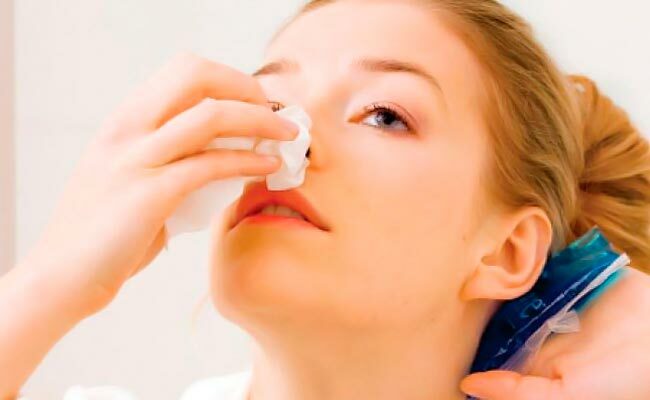 Nosebleeds are more frequent during changes of seasons before the tissues have become accustomed to the change in humidity. A deviated septum – If the wall between the two nostrils is shifted to one side (deviated), air flow in the nostrils is uneven. The altered airflow pattern causes the skin of the nasal septum, on the narrower side, to become dry and cracked, increasing the risk of bleeding. Colds and allergies – Upper respiratory tract infections and allergies cause inflammation in the nose, which can increase the risk of bleeding. More congestion can cause blood vessels to widen (dilate), which makes them more vulnerable to injury. Strenuous nose blowing to clear the nose also can cause a nose to bleed. Exposure to irritating chemicals – The primary culprit is cigarette smoke, even secondhand cigarette smoke. Workers also may develop nosebleeds from on-the-job exposure to sulfuric acid, ammonia, gasoline or other chemical irritants. Medical conditions – Examples include kidney failure, thrombocytopenia (low levels of the blood platelets needed for clotting), high blood pressure and hereditary bleeding disorders, such as hemophilia. Heavy alcohol use – Alcohol interferes with the normal activity of platelets in the blood, and this increases the time needed for blood clots to form. It also makes superficial blood vessels dilate (enlarge), making them more likely to be injured and bleed. Medications that interfere with blood clotting – These include prescription blood-thinners (anticoagulants) and nonsteroidal anti-inflammatory drugs, such as aspirin and ibuprofen. Homeopathic medications and dietary supplements – Some dietary supplements contain chemicals that prolong bleeding similar to prescription blood thinners. Danshen, dong quai, feverfew, garlic, ginger, ginko biloba, ginseng and vitamin E are some of them. Nosebleeds usually involve one nostril, but occasionally both nostrils are involved. If one nostril becomes partially blocked with a blood clot, the blood might flow out the other nostril or down the back of the throat. In a posterior nosebleed (higher up in the nose), large amounts of blood typically flow down the back of the throat. In otherwise healthy people, most mild anterior nosebleeds can be self-diagnosed and treated at home. If your nosebleed is severe and does not respond to first-aid measures, you will need to see a doctor immediately. The doctor will review your health history and current medications. He or she also will ask you to estimate the amount of blood you’ve lost, which usually is based on how long you’ve been bleeding and the number of soaked towels or tissues you’ve used. Next, the doctor will examine your nose to determine where the bleeding is located. If necessary, he or she may insert a lighted, tube-like instrument called an endoscope into your nose to see the site of bleeding. Blood tests may be done to check for any bleeding abnormalities. Sit up (so your head is above the level of your heart), lean forward slightly and breathe through your mouth. With your thumb and index finger, pinch the entire front of your nose (just above your nostrils and below the hard, bony base) and hold for five minutes. At the same time, use your other hand to apply an ice pack or a plastic bag of crushed ice to the bridge of your nose to slow blood flow. After you have pinched your nose for five minutes, release it to see if your nose is still bleeding. Keep the ice pack on for another 10 to 15 minutes. If you cannot stop a nosebleed by using the first-aid measures, call your doctor immediately or go to an emergency room. Also, contact your doctor if blood continues to ooze from your nose, especially if you also have persistent nasal stuffiness or a foul-smelling nasal discharge. In older people, especially smokers, these can be symptoms of a tumor inside the nose or sinuses. In a young child, these may be signs that a foreign object is lodged in a nostril. With a little patience and pressure, almost all uncomplicated anterior nosebleeds respond to simple first-aid measures. Even the rare nosebleed that requires a doctor’s care usually can be treated successfully with cauterization, packing or other options. Even severe posterior nosebleeds can be controlled with appropriate first-aid measures at home. Some people who have excessive bleeding, multiple medical problems or who are taking anticoagulant medications may need to be hospitalized for treatment of a nosebleed.